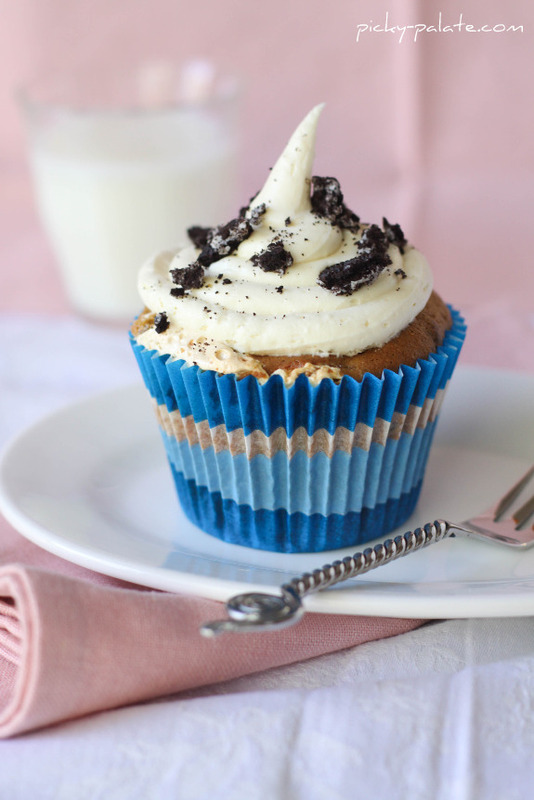 Oreo cupcakes are one of the most popular cupcake recipes I come across. Picky Palate recently posted her version of Oreo cupcakes called Fluffer-Oreo Birthday Boy Cupcakes. 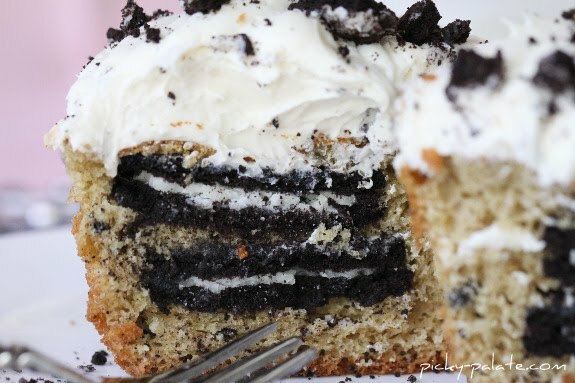 I like her recipe because all it involves is a yellow cake mix, cream cheese, vanilla pudding, marshmallow cream, and of course Oreos. The trick is to layer the batter, Oreos, and marshmallow cream. You can find the full recipe on Picky Palate's website here. "The perkiest cupcakes in town!" "Yes! They are all natural!" "Go ahead! Grab two. You know you want to!" Although, they say that the double "D" actually stands for D-elicious and D-elightful. Clever play on words if you ask me. Their cupcakes are available in two sizes: baby D and double D. There are 22 flavors listed on their website. My first choice would be the Hawaiian Hummingbird. 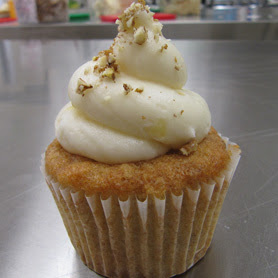 Banana-pineapple cake topped with pineapple cream cheese frosting and toasted pecans. Yum! The Rock Star cupcake is available in two different flavors: vanilla cake infused with bourbon (Rock Star by Day) or chocolate cake infused with Grand Marnier (Rock Star by Night). 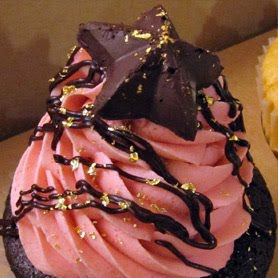 Both are topped with Rocker Pink caramel frosting, Belgium dark chocolate drizzle, hand poured chocolate star, and edible 23k gold flake embellishment. 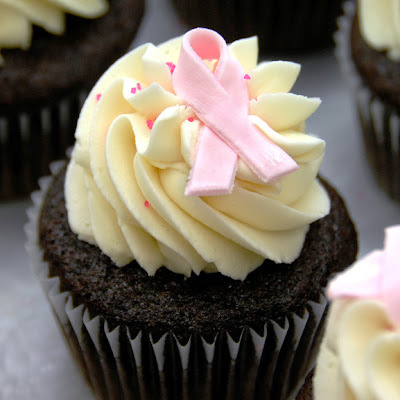 And of course, it's totally appropriate to have a cupcake that benefits the fight against breast cancer. They will donate $5 to Ride for the Pink for every "Ride for the Pink" dozen sold. "Toyota asked documentary filmmaker Jessica Sanders to tell the story of Erica -- a pastry chef/entrepreneur who was saving up to buy a reliable 2010 Corolla to help her business grow. What happened next, Erica never expected. Every Toyota has a story, are you an owner?" I can't imagine how sad my life would be without gluten. But that's just me and that fact that I could eat bread products all day long. Along with their cake mixes, Betty Crocker also provides recipes for gluten-free desserts. 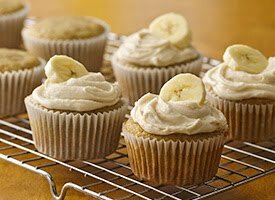 Gluten-free Banana Cupcakes with Brown Sugar Frosting, anyone? 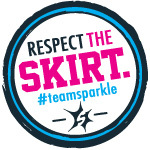 The OC Cupcake Classic was split into three categories: professional, amateur, and youth. Since there were over 70 cupcakes entered in the competition, the judges split the task of sampling all of the cupcakes. I was privileged to try the professional and youth categories. The other three judges split the amateur category into three groups. I judged the youth cupcakes on the Danish scoring system. 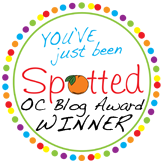 Each entry received an award -- either blue, red, or white. After I finished, the other judges and I picked a cupcake to win "Best in Show" from the cupcakes that received a blue ribbon. We unanimously chose Andrew English's lime and coconut cupcake. A close second place was Kathryn Arblaster's sweet potato cupcake (it was my first time trying a sweet potato cupcake and I really enjoyed it). Congrats Andrew! The judges of the amateur category each picked their favorites from their group of cupcakes. The top cupcake from each group was then sampled by all of the judges to pick the "Best in Show." The winner of the amateur category was Desiree Moser with her lemon cupcake. This cupcake surprised me as I am not a lemon fan at all. The frosting was silky and delicious. Her cupcake was also beautiful. I loved the yellow, orange, and pink colors that adorned it. Congrats! Since there were only three entries in the professional category, each cupcake received an award. First place and "Best in Show" was awarded to Vista Miller for the beautifully-decorated chocolate cupcake. 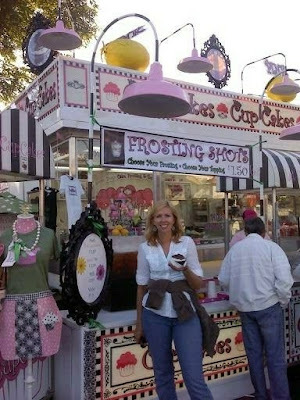 The OC Fair's Cupcake Classic was such a fun event! I've always enjoyed going to the fair and seeing the culinary awards. I feel honored to be a part of that this year. Thank you for everyone who participated in the event. Judging by the number of entries and the large audience, I think the OC Cupcake Classic will be back next year. 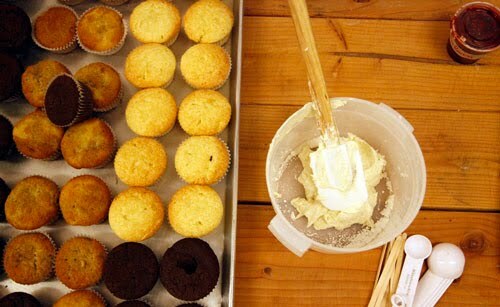 Keep baking, Orange County! See you next year! 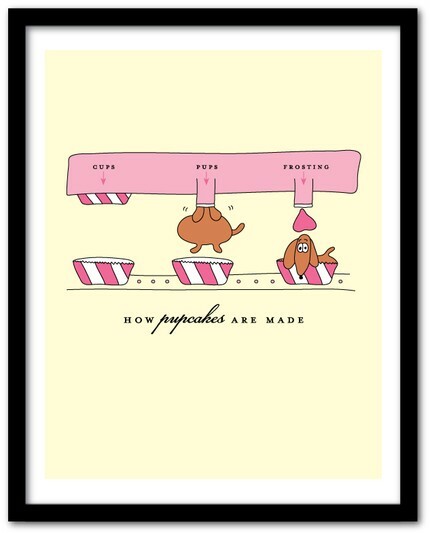 It's definitely cupcake season! During the past month, I have eaten cupcakes at some kind of event every weekend. Good thing my I've upped my triathlon training or I would be gaining some serious pounds. A few months ago I was asked to be a judge at the OC Fair's OC Cupcake Classic. Of course I was thrilled because I LOVE the food. So much good food in one place! 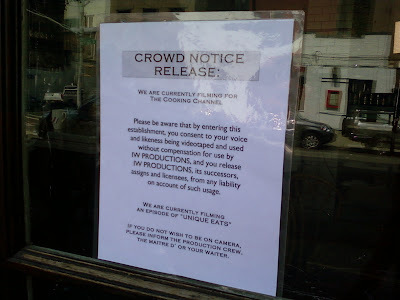 Saturday was the big event. Unfortunately my husband was out of town, but my brothers and friend were there to support me and take pictures. The OC Cupcake Classic is a cupcake competition that is open to everyone. There are three categories to enter: Professional, Amateur, and Youth. First: me, the Cupcake Activist. You all know me. Next, one of my favorite Orange County cupcake bakers, Monica Serratos. 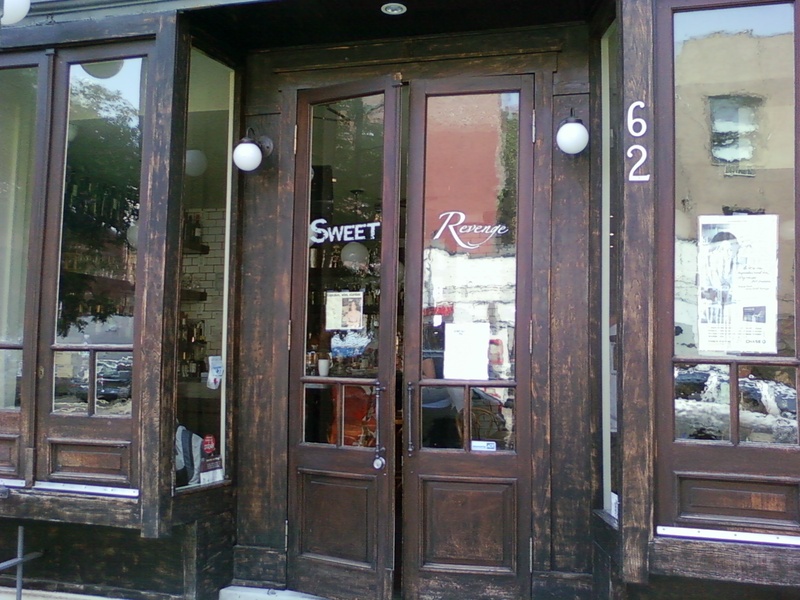 Monica is the owner of Two Parts Sugar, but you might recognize her from the hit Food Network show "Cupcake Wars." Monica was a contestant on the pilot episode that aired in December. I know Monica from all of the cupcake events we've attended together. Not only is she super sweet, but she makes a delicious raspberry red velvet! Another well-known judge was Nancy Luna, writer of the Fast Food Maven blog for the OC Register. 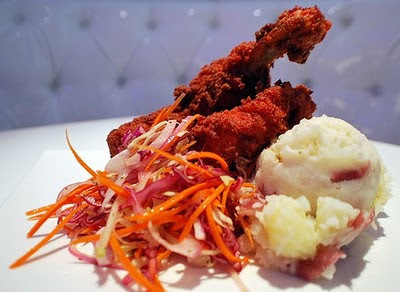 Nancy's column reports on restaurant trends, culture, and trends. I've been featured in her column several times. Although we've corresponded many times, this was my first time meeting her. The last judge was Babette Pepaj, founder of Bake Space, a social network for foodies. Bakers can swap recipes on the website and build friendships, based on their shared love of food. I did it! I survived another cupcake competition! 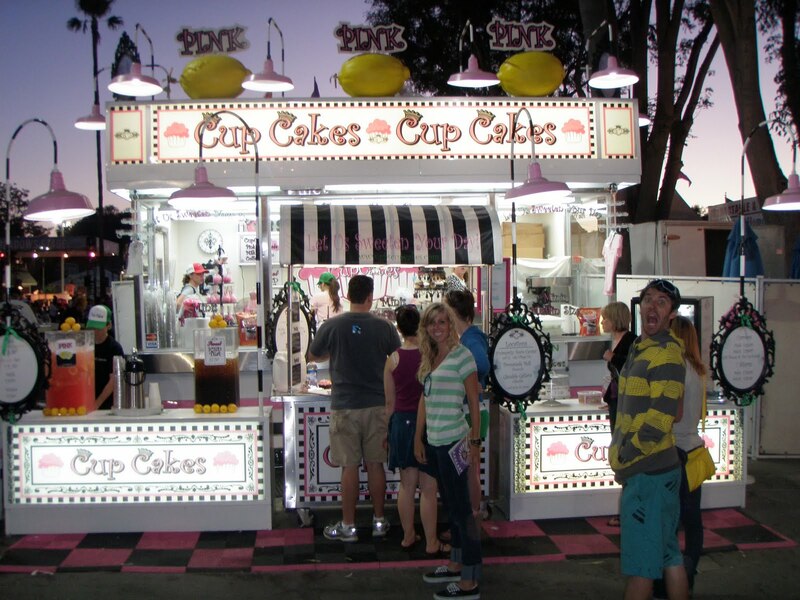 Stayed tuned this week for coverage of the OC Fair's Cupcake Classic. 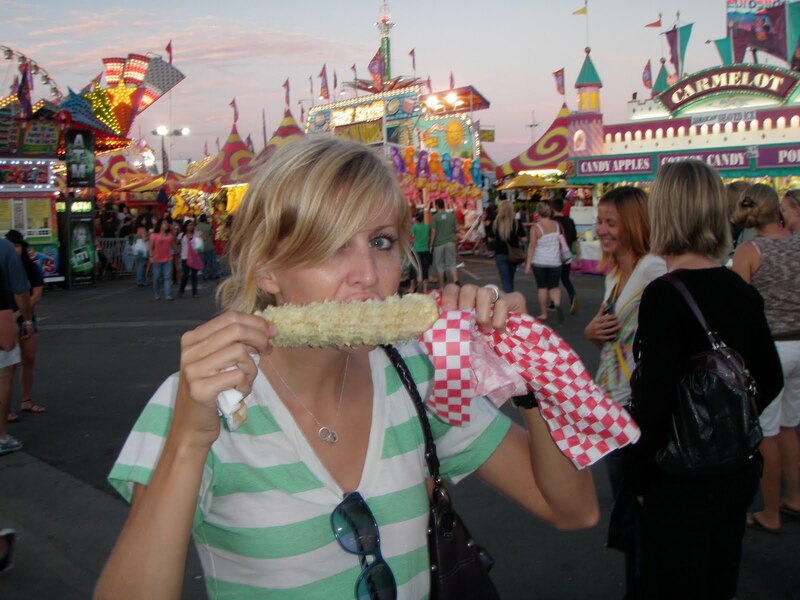 I have a love affair with the Orange County Fair. I'm not interested in the giant slides, ferris wheel, games, or Weird Al's Brain. I just want fried food. My first experience with cupcakes at the OC Fair began two years ago when I discovered the deep-fried cupcake. Although surprisingly delicious, it has yet to reappear at the fair again. 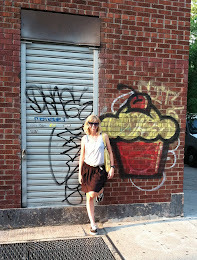 The next year, after finding out that the deep-fried cupcake was not back, I found CB's Cupcakes. They sold pretty typical cupcakes, except that you got to build the cupcake yourself. You pick the cake, frosting, and topping. Not a bad idea, but makes for a longer line. So the OC Fair ends on Sunday and I have yet to go! My husband has been traveling a lot for work and we just haven't had the time to eat lots of fried food! 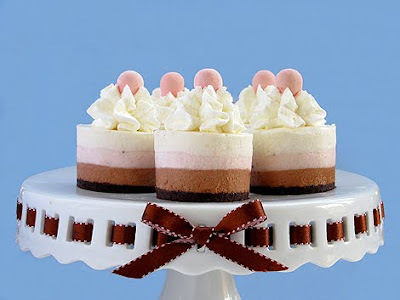 Fortunately, I will be attending the fair this Saturday to judge the OC Cupcake Classic. Come stop by the Promenade Stage between 1p-3p and say hi. Since I haven't had the chance to scope out the food this year yet, my mom let me know that CB's Cupcakes is back and selling cupcakes again. Thanks Mom!